Dr Seuss’ How the Grinch Stole Christmas is an absolute gem. I know it nearly by heart, singing along to the catchy songs and quoting the script right along with Boris Karloff. I am of course talking about the 1966 animated television special, not this live-action version that tries way too hard. Obviously turning an illustrated children’s book into a feature length film requires the story to be expanded to fill time. There are some really great examples of movies that have done this well (Jumanji comes to mind), but this is not one of them. The idea that the Grinch hates Christmas because he was bullied as a kid is an OK concept. It worked reasonably well, but I think it could have been executed better. There’s also this whole love triangle angle that seems unnecessary and forced, and the moral of the story– that Christmas is about more than materialism– is really shoved down the audience’s throat. I did like the sets, and the make up is well done. Jim Carrey sometimes hits the mark as the cantankerous Grinch, but I find his overall performance too hammy. I mostly just wished I was watching the animated version. It may only be 26 minutes long, but it’s more enjoyable and meaningful than this movie. To paraphrase Dr Seuss himself, the three words that best describe this movie are as follows: stink, stank, stunk. I really can’t think of anyone better to bring to life a cartoon character like The Grinch than Jim Carrey. The guy has made a career out of playing rubber faced idiots, so it makes perfect sense to me that he would also play a cartoon character. 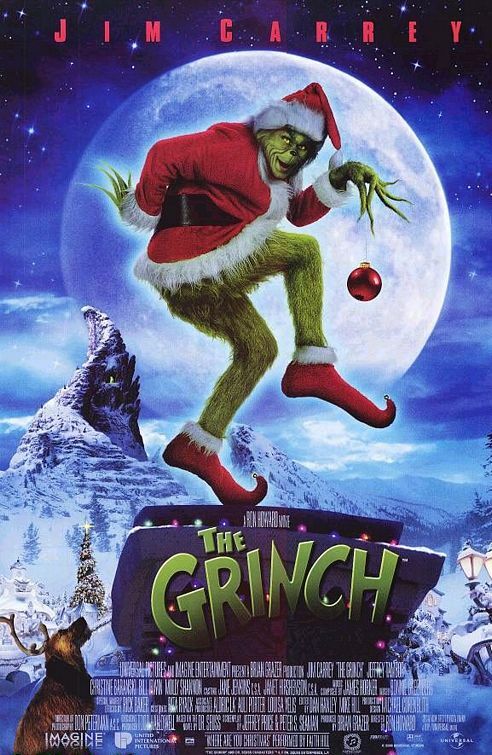 The Grinch is an adaptation of the famous Dr Seuss story How the Grinch Stole Christmas. Carrey plays the titular Grinch, a lonely and bitter green haired goblin who lives in a mountain near Whoville. The citizens of Whoville love Christmas and pull out all of the stops every time it comes around. The Grinch hates the citizens of Whoville, because when he was a child they all made fun of his green hair and ugly appearance. To get back at these bullies, the Grinch decides to steal Christmas from Whoville. Taking all of their presents and Christmas decorations while everyone sleeps on Christmas Eve. Only the Christmas spirit of a young girl (Taylor Momsen) can help to melt the Grinch’s heart and bring Christmas back to Whoville before the Grinch ruins it forever. This is Carrey at his best. Even under all the Grinch makeup, he is still able to pull off some of the best facial expressions and voices that only he can. I love that director Ron Howard seems to have given Carrey free range for this film. I imagine the outtakes for The Grinch would be almost as funny as the actual movie. The Grinch is a nice story with a good message about the spirit of Christmas. There are also some nice ideas about anti-bullying and being friendly to everyone, despite their appearance. There is not much more to say about this film, it is a cute Christmas story with enough laughs to entertain the whole family. I prefer Elf to this film, but The Grinch is still a lot of fun. This film led to a number of Dr Seuss stories being adapted into films like The Cat in the Hat and Horton Hears a Who, but none of them match this film in terms of quality and entertainment value. Also, Taylor Momsen: What the hell happened to her?